Shree Laxmi Glasstech offers a truly diversified spectrum of IS Machine variable & spare parts for efficient glass container production well designed modular sections and machine structure make it possible to optimally meet specific production output requirements. In order to meet excellent quality standards, we are supplying Blow Head Arm. 1. Hinged Back Cap for quick change retention to the main casting eliminating the risk of losing or mixing back caps. Improves efficiency and reduces down time. Our reputed entity is engaged in supplying Blow Head Arm. Solar Enterprise is manufacturing into all types of P.G Q.C Blow Head Arm which used in making Glass Bottles. 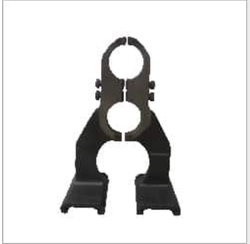 We are engaged in offering Blow Head Arm.